This issue of Clinics in Plastic Surgery, guest edited by Drs. Robert F. Centeno and Constantino G. Mendieta, is devoted to Gluteal Augmentation. 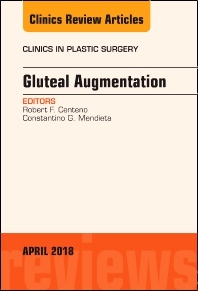 Articles in this outstanding issue include: Gluteal Aesthetic Evaluation and Classification; Clinical Anatomy in Aesthetic Gluteal Augmentation; Complications in Aesthetic Gluteal Augmentation; Practice-Based Patient Management Strategies in Gluteal Augmentation; Sub-fascial Gluteal Implant Augmentation; Sub-muscular Gluteal Augmentation; Intramuscular Gluteal Augmentation with Implants; Intramuscular Gluteal Augmentation: The XYZ Method; Gluteal Augmentation and Contouring with Autologous Fat Transfer; Autologous Flap Augmentation: Island Technique; Autologous Flap Augmentation: Moustache Technique; Autologous Flap Gluteal Augmentation: Split Gluteal Flap Technique; Autologous Flap Gluteal Augmentation: Purse-String Technique; Excisional Buttock Lifting and Revisional Procedures.